A set of tools and processes used to plan and control a project or a program using earned value management methods. For an EVMS to be effective, it needs to integrate the management of costs, schedule and work scope, establish a baseline plan against which progress of the project or program will be measured, and apply earned value management methods to monitor the project, alert to issues and help implement corrective or mitigation actions. Reference documents for the constitution of an EVMS are ANSI/EIA Standard 748 in the United States, DIN 69901 in Germany and BS6079 in the United Kingdom. 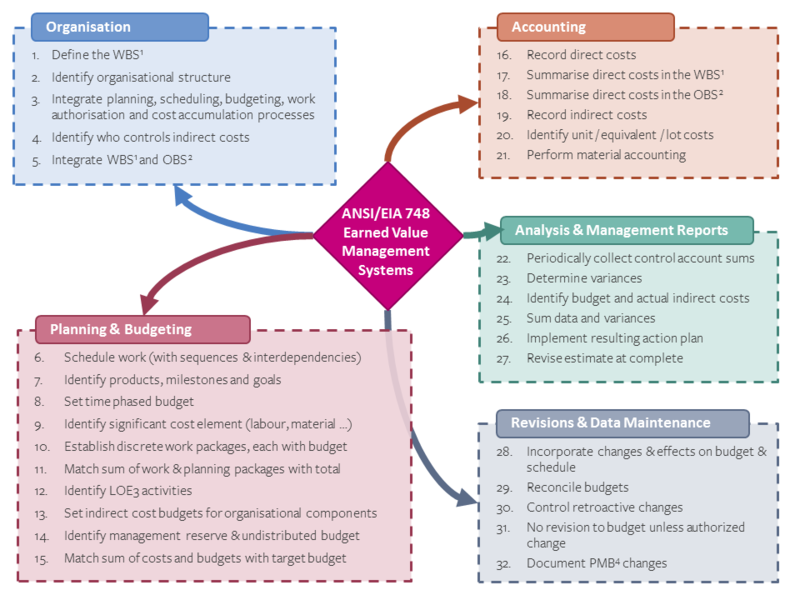 What is an Earned Value Management System (EVMS)? To implement Earned Value Management (EVM) in an organisation, you need a system that will provide the data, structure, standardisation and calculation methods necessary to compute and monitor the different elements of EVM. An EVMS therefore is a system that provides the necessary integration between costs, schedule and work scope together with the tools to plan and manage them, establish baselines, track the different cost and performance indicators, and perform analyses and forecasts based on the accumulated data. The scope of data and processes required to implement EVM means that no two companies will have the same tools and setup. To help organisations design and implement an effective EVMS, several standards have been published, the most well know of which is ANSI/EIA Standard 748 in the United States. ANSI-748 lays down 32 guidelines, grouped under 5 umbrella topics, that cover the whole of the EVM calculation and monitoring process. Other project or program management standards include sections on EVM such as DIN 69901 in Germany and BS6079 in the United Kingdom. Certain government contracts may require the contractor to obtain certification/validation of its EVMS, either by dedicated government agencies such as the Defence Contractors Management Agency (DCMA), other third-parties, or self/peer review, depending on the agency overseeing the contract. Planisware includes out of the box all the elements required to build a compliant EVMS, and several of our clients have successfully obtained DCMA certification with Planisware as an essential system.